While the political history and prominent figures of Ancient Rome are well known, accounts of daily life in that time and place often remain untold. 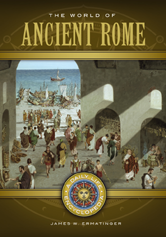 This fascinating encyclopedia explores this period from a social and cultural perspective, digging into the day-to-day activities of how Romans dressed, what they ate, how they worked, and what they did for fun. Drawing from recent archaeological evidence, author James W. Ermatinger explores the everyday lives of Roman citizens of all levels and classes.